It seems like he is finally back-tracking. But America, meet the Rudy Giuliani that New Yorkers were all too familiar with. You may have noticed his standard method operandi is only one way, and that is to relentlessly attack some more. Granted, former elected officials try to stay relevant when they leave office, and to stay in the public eye, this means from time-to-time engaging in political theatrics on television with inflammatory comments. Democrats do it. Republicans do it. Independents do it. If ever there was a case to illustrate this point, look at the actions of this one-time failed presidential candidate. I know Giuliani well, having moderated live TV shows with him, and shared personal and private time with him in the basement City Hall apartment for New York’s Chief Executive. But “America’s Mayor,” broadside against President Obama is giving new meaning to the term attack-mode. Rudy is a workaholic, but maybe its time for a vacation. “He doesn’t love you. And he doesn’t love me. He wasn’t brought up the way you were brought up and I was brought up through love of this country,” Mr. Giuliani said. Just weeks ago, Giuliani also found himself on the defensive when he took on the issue of black-on-black crime. It is this writer’s strong opinion, on that occasion, political correctness may not have been in his corner, but Giuliani was correct with his assessment. This time I ask you. Did he go too far? Democrats charged Rudy with playing the race card. The chairwoman of the Democratic National Committee, Debbie Wasserman Schultz,dismissed Mr. Giuliani and tried to connect him to the rest of the potential 2016 Republican presidential candidates. Investigative Journalist Wayne Barrett wrote a New York Daily News column that severely attacked Giuliani’s personal life. As far as the president’s heritage, his grandfather served in World War II while his grandmother worked on a B-29 assembly line. Let’s not forget, Giuliani as mayor of New York City was highly polarizing, though he did clean the city up. 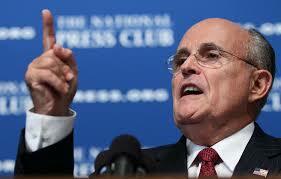 Giuliani goes in attack-mode, full throttle, and this time, he was not winning in the court of public opinion. I too, join you Giuliani as millions of Americans do, in wishing President Obama would use the term “Muslim Terrorists.” But to question Obama’s patriotism was a low blow. And maybe, just maybe, Rudy is getting the message.